Awesome dresses and fun, funky separates by Hannah Banana will win your growing girl rave reviews at school and parties this year. Our Hannah Banana apparel collection at Adorables Children offers contemporary flourishes on fashion basics and this fashion house’s innovative new takes on the once ordinary tee. Camisole tops in bold designs, cute one-piece pull on jumpers for warm weather fun and skirted shorts promise to become this year’s wardrobe staples for fashion-forward girls. Hannah Banana is the hip older sister of Truly Me and Baby Sara in the Sara Sara family of girl’s fashion brands. We also have Truly Me separates and “two-for” dresses with kicky skirts attached to the top for little girls to tweens. Find darling takes on trend-setting children’s fashions in our Baby Sara collection of premium-fabric designer apparel for infant girls, toddlers and younger girls up to sizes 6X. This brand offers the latest looks in tunic tops and hanky hems on dresses this season. 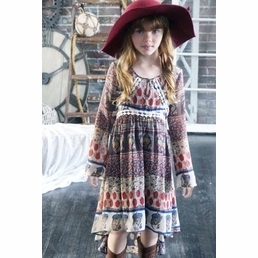 Famous-maker children’s clothing that’s crafted for style and comfort will allow your growing girls to feel confident, knowing they’re wearing the best. This is when they learn that attention to detail can make the difference in a top or skirt and in so many other facets of their life besides fashion. Let them explore the little flourishes with you to encourage little girls to care for their new wardrobe. Let them be creative by experimenting with separates to create original looks. With the mix of solid-color and bold pattern separates in our Hannah Banana collection, they will discover why fashion can be so much fun. Also shop our famous-maker line of shoes, sandals and boots for little girls. \See the entire Hannah Banana Collection here!